Clifton Park, located in the northwestern corner of Lakewood, Ohio along the bluffs of Lake Erie and the Rocky River Valley, was the brainchild of a group of real estate developers who envisioned it as a summer resort in 1866. Amenities included beaches and boating, picnic groves, a dance hall, and beer gardens. After many successful years the resort's popularity began to wane, so in 1895 the Clifton Park Association turned their focus toward an exclusive residential community. The association hired famed landscape architect Ernest W. Bowditch to design Clifton Park. Bowditch was nationally known for his work on many Newport, Rhode Island estates, including the renowned Breakers, as well as the communities of Tuxedo Park, New York. He was also behind a few other projects in the Cleveland area, including Rockefeller Park, the Euclid Heights allotment, and Shaker Lakes on Cleveland's east side. Unlike the grid pattern of most other Lakewood neighborhoods, Clifton Park was conceived as a collection of winding streets covering about one-half square mile. 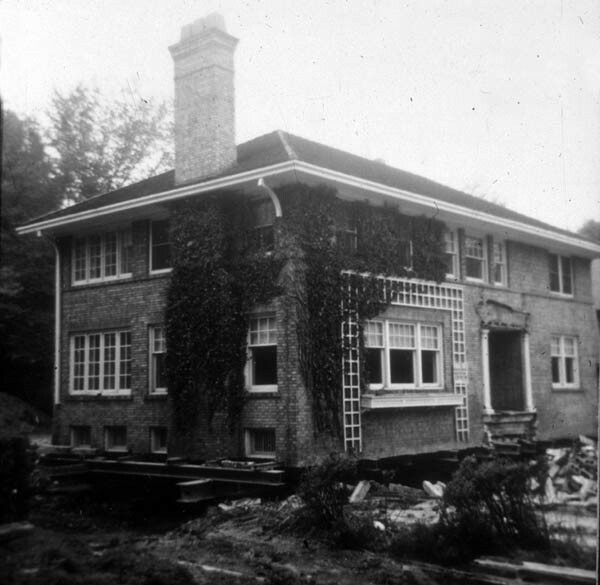 The first home was built as a summer retreat by attorney William Starkweather, the son of former Cleveland mayor and judge Samuel Starkweather. The oldest home still standing is at 17862 Lake Road, built in 1899 by the prominent Cleveland business executive John G. Jennings. One of the gems of this new community was the Clifton Club, located at 17884 Lake Road, which opened its doors on August 22nd, 1903. 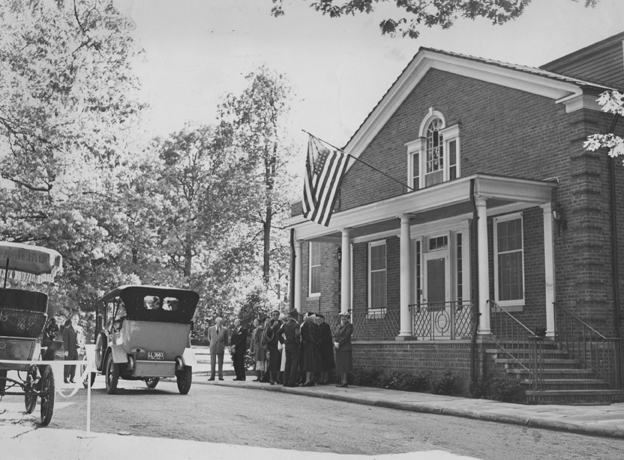 The club served as Lakewood's social center for many years with events such as lunches, dinners, teas, informal dances, and weddings. Unfortunately, the building burned down on January 11, 1942. A new building was placed on the original site in 1950 where it still stands today. In the early 1960s, Clifton Park was cut in two when Clifton Boulevard was extended to a new bridge built over the Rocky River. Many homes were razed and the winding streets were now disconnected. Property values south of Clifton dropped, and when the neighborhood was placed on the National Register of Historic Places in 1974, only the streets north of Clifton were included. Lake View House, 1874: One of the early attractions of the park, the Lake View House was a hotel at Clifton Park Resort overlooking the lake on the east bank of the Rocky River. People traveled to Clifton Park either via railroad (which was built by the park developers) or by horse and wagon along bumpy dirt roads. Image courtesy of Cleveland State University. Michael Schwartz Library. Special Collections. 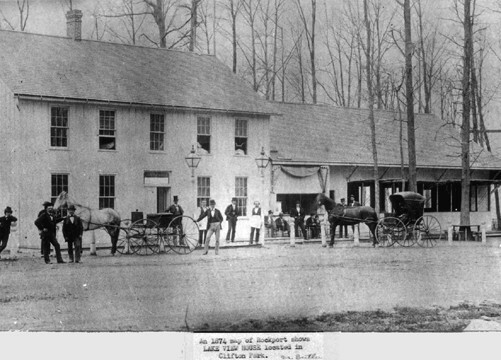 John Knoll's Beech Grove, 1887: Beech Grove was a very popular destination for visitors to the resort. The complex included a beer garden, dance hall, dining hall, bowling alley, shooting gallery, bath houses, and a picnic ground. Image courtesy of Cleveland State University. Michael Schwartz Library. Special Collections. 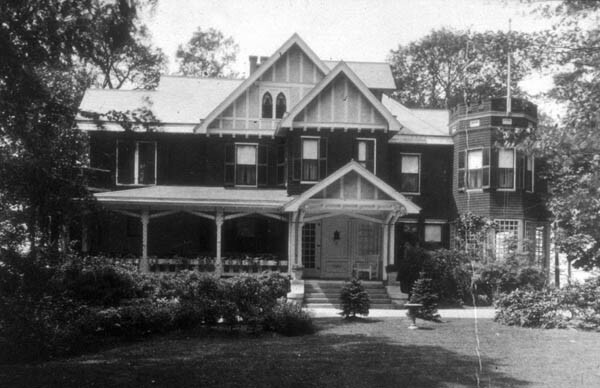 The Wywoka Residence at 17866 Lake Road : Wywoka, the first residence built in Clifton Park, was built by William and Leafie Sims Starkweather in 1894 and was enlarged over the years. Leafie was the daughter of Elias Sims, one of the nine developers of the Clifton Park Association. Image courtesy of Cleveland State University. Michael Schwartz Library. Special Collections. 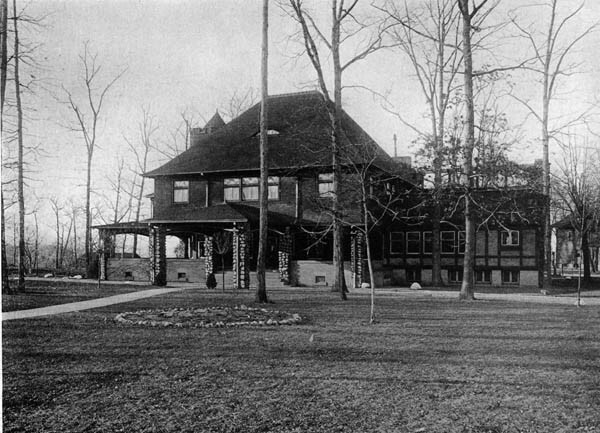 The Restcliff Home at 17862 Lake Road: The oldest home still standing is at 17862 Lake Road, built in 1899 by the prominent Cleveland business executive John G. Jennings. Homes built by many other affluent families, such as the Gliddons, Hannas, Stouffers, and Wintons, were soon to follow. Image courtesy of Cleveland State University. Michael Schwartz Library. Special Collections. 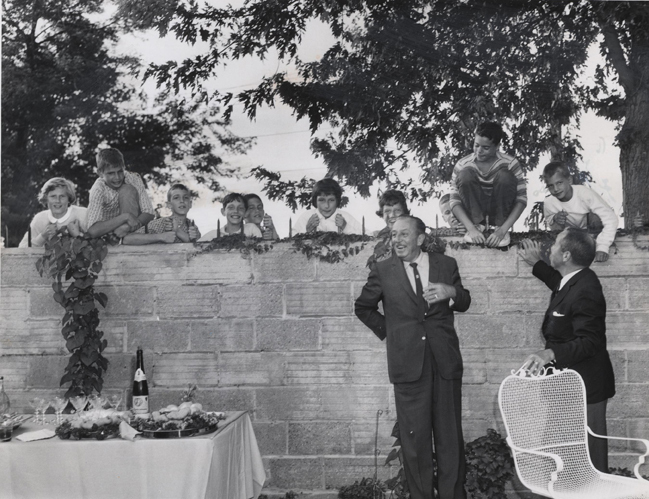 Walt Disney at 17784 Beach Road : Walt Disney visited the Clifton Park summer home of Cleveland businessman Vernon Stouffer in 1961. Disney was in Cleveland to advise the zoo on new exhibits, and Stouffer was the president of the Cleveland Zoological Society. Image courtesy of Cleveland State University. Michael Schwartz Library. Special Collections. The Clifton Club at 17884 Lake Road: The social center of this new community was The Clifton Club, which opened its doors on August 22nd, 1903. The club was built with gray bricks trimmed with cobblestone, and the second story was sided with dark red shingles. The interior was lavishly decorated and included a parlor, dining room, billiard room, ballroom, and third floor guest rooms. Image courtesy of Cleveland State University. Michael Schwartz Library. Special Collections. 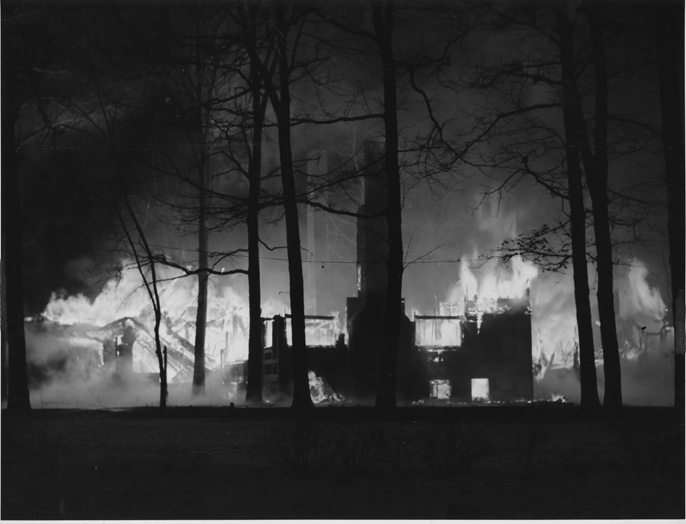 Clifton Club Fire : Unfortunately, the building burned down on January 11, 1942. The fire was believed to be caused by an overheated furnace or an overheated hot water tank. A new building was placed on the original site in 1950 where it still stands today. Image courtesy of Cleveland State University. Michael Schwartz Library. Special Collections. The New Clifton Club : The "new" Clifton Club celebrated its 50th anniversary on June 1, 1952. To this day the club is still the site of many events including lunches, dinners, dances, and weddings. Image courtesy of Cleveland State University. Michael Schwartz Library. Special Collections. Path of the Clifton Park Bridge Project : This map shows the path of the Clifton Boulevard extension to the bridge over the Rocky River. 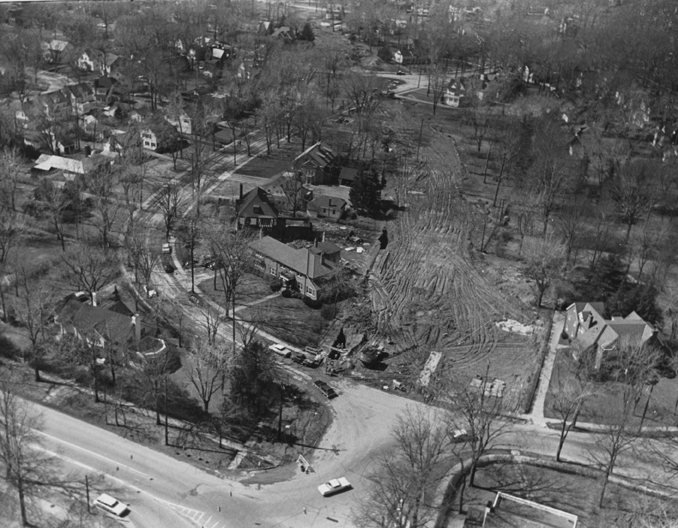 Many houses in the path of the extension were moved, but unfortunately, many were also razed in the early 1960s. Image courtesy of Cleveland State University. Michael Schwartz Library. Special Collections. 18098 Clifton Road : The residence at 18098 Clifton Rd. ready to be moved to its new location at 13824 Lake Ave. The house was moved to make way for the 1962 construction of the Clifton Park Bridge. Image courtesy of Cleveland State University. Michael Schwartz Library. Special Collections. Ariel View of Clifton Boulevard Extension: When the path that cut Clifton Park in two was built in the 1960s the park lost its original layout. This cost the area south of Clifton Park to also lose much of its monetary and historic value. Image courtesy of Cleveland State University. Michael Schwartz Library. Special Collections. Tim Knapp, “Clifton Park,” Cleveland Historical, accessed April 23, 2019, https://clevelandhistorical.org/items/show/374. Published on Dec 21, 2011. Last updated on Apr 18, 2017.